The front yard landscaping is the image your home presents to the world. Ideally the landscaping enhances the house, complements the neighborhood, and expresses your tastes. There are many different elements that can be incorporated into a front yard landscape. 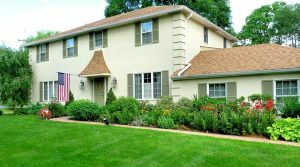 Some of these are: Foundation plantings, island beds, decorative flowering trees, beds with flowers and shrubs, plantings near the mail box, plantings along the front walk, the front walk itself, lighting, screening plantings, hedges, the shape of the driveway and parking areas, driveway edging, shade trees, and the front lawn. Call us today at 6105-565-9910 to set up an appointment with one of our professional landscape designers.